LEVITTOWN, N.Y. -- To untold numbers of children, he’s simply Uncle Tim. Nearly 3,300 babies across the country who otherwise might have been abandoned and perhaps died have found homes in the past 17 years, thanks in part to the efforts of Tim Jaccard, a retired New York police ambulance medic who grew weary of responding to calls of dead infants abandoned in trash cans and alleys. Not only did he help spearhead a movement in all 50 states to enact “safe haven” laws that give mothers in crisis the option of leaving their newborns at police stations, hospitals or firehouses without fear of prosecution, he also founded the national Baby Safe Haven organization that acts as a go-between to make such drop-offs as safe as possible. Leaving a newborn at a firehouse door in the freezing cold, for example, could still be dangerous for the infant. Mothers can instead call a national hotline (1-866-510-BABY) and arrange a safe handover. Some give birth at a hospital and surrender the child to Baby Safe Haven representatives who work with local social services agencies. Jaccard’s eyes redden when he talks of the tragic abandonments he dealt with in his 37 years as a medic. But there are also the more hopeful cases he documents on a bulletin board jammed with dozens of snapshots of the children relinquished through Baby Safe Haven. According to the alliance, 3,298 babies had been turned over with the help of Baby Safe Haven nationwide in 17 years, including 167 so far this year. The holiday season often sees an uptick in the numbers. In one memorable case from last year, Jaccard said a distraught mother had called the Baby Safe Haven hotline seeking information about New York’s law just minutes before a healthy newborn boy, his umbilical cord still attached, was left at the manger of a Nativity scene at New York City church. The reasons for such cases are as varied as the children, Johnson said, dispelling a notion that the mothers and fathers are young teenagers. Some are college students reluctant to tell their parents and can’t raise a child alone. Many are women in “toxic relationships,” with spouses already abusing older children in the home and want to shield a new baby from that fate. 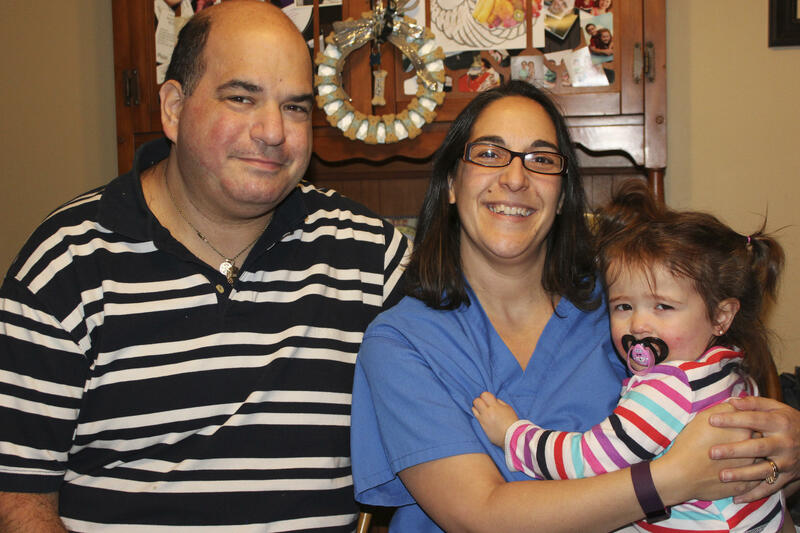 Larry and Jennifer Mergentheimer, of Levittown on New York’s Long Island, are on the other side of the safe haven equation. Their 18-month-old daughter, Rebecca, was adopted after being born and given up in a hospital on Mother’s Day 2015. They say “Uncle Tim” regularly checks in with the family. His wife, Jennifer, a 41-year-old radiological technologist, says the precocious toddler who loves Mickey and Minnie Mouse completed their family. “We wanted to have a baby and a family for so many years and it was such a struggle. Just to have her in our lives, it’s the greatest thing in the world,” she said.